What does political meddling in the trial say about post-election politics in Iraq? How has the resignation of Judge Rizgar Amin affected the trial? What are your impressions of Saddam's trial to date? Michael Scharf is Professor of Law and Director of the Frederick K. Cox International Law Center at Case Western Reserve University School of Law. Scharf was part of an international team of experts training judges and prosecutors of the Iraqi Special Tribunal. In February 2005, Scharf and the Public International Law and Policy Group, a NonGovernmental Organization he cofounded, were nominated for the Nobel Peace Prize for the work they have done to help prosecute major war criminals. Scharf has published more than 50 articles and seven books, including Balkan Justice, which was nominated for the Pulitzer Prize in 1998. 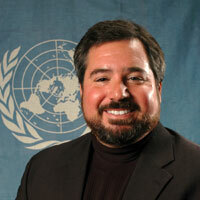 In 2002, Scharf established the War Crimes Research Office at Case Western Reserve University School of Law, which provides research assistance to the Prosecutors of the International Criminal Tribunal for Rwanda, the Special Court for Sierra Leone, the International Criminal Court, and the Iraqi Special Tribunal. During the Administrations of President Bush (the elder) and President Clinton, Scharf served as Attorney Adviser for U.N. Affairs at the State Department, and was awarded the Meritorious Honor Award for the role he played in the establishment of the Yugoslavia War Crimes Tribunal.